Hi there! 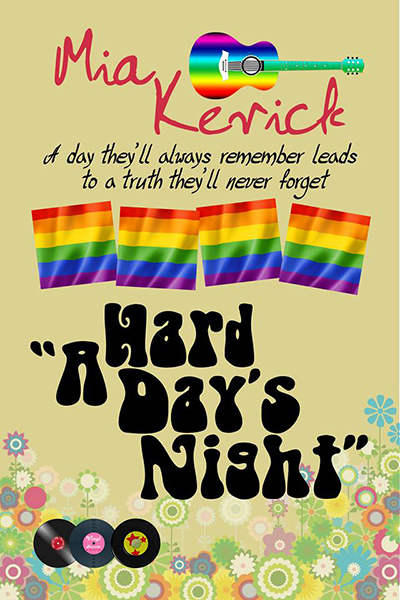 Today I’m sharing some love for Mia Kerick’s new release, HARD DAY’S NIGHT. I’ve reviewed a few of Mia’s books, THE RED SHEET, RANDOM ACTS, and LOVE SPELL, and I just adore her heartfelt, and compelling M/M fiction. Make sure to drop down and enter the giveaway for a $15 Amazon gift card. Not that I necessarily agree with the sentiment, I respect that kind of direct-ness in a person. This attempt at telling-it-like-it-is is definitely an improvement, but it’s still not right on the money, and I’m nothing, if not specific. This is a tender, loving story about two best friends figuring out their sexuality together. Kalin, a Beatles aficionado who’s been called “Lennon” since middle school, has a serious crush on his best friend Fin. Fin is the only son of a wealthy family, and is expected to go to Stanford, become a lawyer, and enter the family firm–even though he’s really only interested in film making. Fin is a champion skier, and usually spends all his weekends on the slopes, but he’s due to stay home this weekend and Lennon has convinced him to spend 24 hours in the “gay experience.” This includes “gay” makeovers, including guyliner, Zumba dancing, and frilly cappuccinos. What he didn’t plan, but is grateful to find, is Fin’s especially serious take on the whole day’s events. These two guys are so tender, and so earnest. They know they are way closer than two hetero guys should be, and they are afraid what that means. Well, Fin is. He has a lot of expectations to live up to, and he is a born “pleaser,” working hard to please everyone. I think he went along with Lennon’s plan simply to please him, at first, and finding that some of the gauche stereotypes they indulged in were more appealing then he could have imagined. For a short read, this novella is very powerful, and would surely appeal to questioning teens. Expect some dark moments, too, when Fin and Lennon have barely acknowledged their sexuality and run afoul of some serious hate. I feared they wouldn’t come out of it well, but they shined on, and it was very touching. I totally loved the integration of Beatles wisdom, thoughts and lyrics into the prose. It was true that love was all they needed. Interested? You can find HARD DAY’S NIGHT on Goodreads, Amazon, AllRomance and Gumroad. It definitely appeals to me! It looks adorably angsty. I can’t wait to read it. Thanks for welcoming me on your blog today!! I appreciate the support! Publishing this book was a no brainer and I don’t mean that in a demeaning way at all. It means that Mia is one of our great writers whom we cherish and appreciate because of how and what she writes. To us, Mia is not about quantity in her books. To us, Mia is quality. And that makes all the difference. I’m so glad you did. I finished it last night (er, this morning!) and adored it. Thank you for the kind words, Louis!